The NoHo and SoHo neighborhoods, showing the area covered by their unique M1-5A and B zoning. 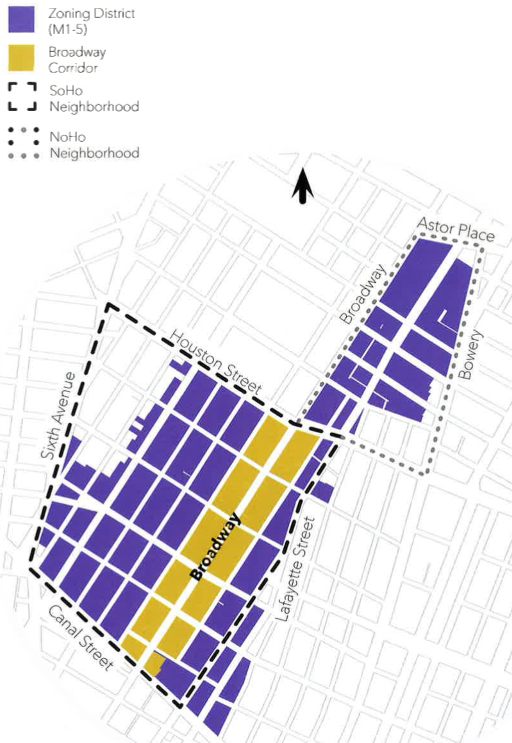 Borough President Gale Brewer, the Mayor’s Department of City Planning, and City Councilmember Margaret Chin have initiated a process to examine the unique zoning of the NoHo and SoHo neighborhoods, and potentially propose changes. They have formed an advisory panel of stakeholders to help inform the process. In spite of the fact that GVSHP is the largest membership organization covering the affected areas (all of NoHo lies within our catchment area, as does a part of the SoHo zoning district), the organizers refused to allow GVSHP to participate in the panel, while Real Estate lobbyists REBNY have a seat at the table. However, several groups with whom we work closely and who are strong advocates for these neighborhoods and issues we care about are on the panel. Nevertheless, we have seen this administration consistently use the rezoning process as a way to strip away hard-fought-for neighborhood protections and to grant favors to developers and campaign contributors to the Mayor. Unfortunately, in some cases, some of our elected officials have abetted this process. The first meeting to which the public will be allowed access on this topic is this Wednesday, February 6 at 6:15pm at P.S. 130, 143 Baxter Street (Grand/Hester Streets). While the meeting is being billed as an “open house to get community feedback to shape the future of the SoHo and NoHo neighborhoods,” it is important that the public attend, especially SoHo and NoHo residents, to speak up for preserving the special character of these neighborhoods. A second public meeting will be held on February 28 (time and location TBD). We will continue to keep you informed about and closely monitor this process.